Genomenon said it will donate licenses allowing clinical scientists working with Rare Genomics Institute to access the company’s Mastermind Genomic Search Engine, under a partnership whose value was not disclosed. Rare Genomics Institute is a Downey, CA-based nonprofit established in 2011 to provide direct support to undiagnosed rare disease patients and their families. The Institute seeks to help investigators diagnose rare diseases and accelerate research by connecting patients to researchers. Researchers affiliated with and donating their time to the Institute will be able to use Mastermind’s professional edition to more quickly find data intended to lead to a diagnosis for their patients, the Institute said. The number of licenses was not disclosed. “We strive to use the best software applications to analyze and interpret patient-derived genomic data and subsequently helping the rare disease patients shorten their diagnostic odyssey. We are excited to use Genomenon’s latest Mastermind engine to mine genomic data to enhance our analysis workflow,” Jimmy Lin, CEO of Rare Genomics, said in a statement. The Institute works to connect families, physicians, and scientists through “RG sites” consisting of a research facility capable of performing DNA sequencing and a clinician and/or scientist that can interpret the data from sequencing. Patients are assigned a patient advocate to work with them in identifying the site that best matches their needs, and guide them through sequencing and results. “We currently have a volunteer workforce of 175 individuals with unique expertise spanning marketing to clinical sequencing to research,” the Institute stated on the nonprofit information service GuideStar.org. Another resource of the Institute, Rareshare.org, is a 10,000-member online community for patients and families affected by rare disorders, as well as healthcare professionals. Mastermind is designed to link data on DNA mutations from patients with citations from scientific publications, with the goal of understanding the clinical impact of each mutation. Mastermind aims to comprehensively identify and prioritize all clinically relevant articles, and to date has indexed nearly 6 million scientific articles covering every disease, gene and variant. The indexed articles contain data on more than 2.3 million variants. Among users of Mastermind are diagnostic labs seeking to accelerate genomic interpretation for Next Generation Sequencing (NGS) of DNA. Genomenon also licenses Mastermind to pharmaceutical and other life science companies seeking to identify and prioritize genomic biomarkers for drug development, drug trial patient identification, and gene panel design. 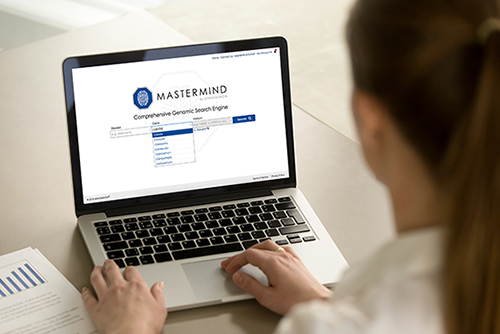 According to Genomenon, Mastermind offers the world’s largest index of medical articles cataloguing the genetic relationships between DNA and human diseases.